The Wildwood Manuscripts is a very pompous name for what I'm calling a set of house-rules and classes I'm putting together for my soon-to-be nascent Dolmenwood campaign. It is something of a combination of Lamentations of the Flame Princess with some of the rulings from Beyond the Wall. The idea is to have classes that lack a degree of the utility you find in say, the base Elf or Dwarf, and instead drip with a degree of flavor. The hope is to cultivate a sense of broad setting and lived-in world without overly defining too much. The first class I've attempted is one I personally enjoy simply due to how boring they are in other media. The Gnome, which shares too much with the Halfling (which is another thing I have issues with...) and when they don't, they're often silly magical, inventors, or just too over the top for my case. So the Gnome, as I've presented, is more or less a very small fey whose people escaped slavery from a more powerful type of fey. Now free from their shackles, they seek to enjoy their lives and prove that they are not cowards or kinslayers to any who may accuse them. They also seek to get work done because the only thing more annoying than being forced to do work is watching someone do work poorly... Which addresses those stories of them helping out cobblers until the cobblers got too lazy. All art by Wil Huygen, used without permission. Gnomes are inhabitants of the wildwood, ancient fey spirits who dwell in regions where the firmament between the mortal world and the Faerie Realms are tenuous at best. They care little for mortals or the affairs of other races, they simply desire to make do with what is theirs and enjoy the bounty of nature. Gnomes seldom get involved with other races due to their seemingly stoic aloofness, though there are many notable folktales of gnomes assisting mortal farmers and workers in doing their daily labor---in such cases, the gnomes consistently require a degree of deference and respect while paradoxically desiring to be left alone and ignored by the mortals. A gnome does what it does for mortals because they are seemingly bothered that the job itself is being done ineffectively by those who ought to be large enough to do it well. A gnome is never much larger than a particularly large yam or poultry bird, the tallest of known gnomes in folklore being perhaps around two feet tall. Regardless of their small height they move with deftness and speed, and can hold their own as they were a much larger creature. Gnomes don't seem to care much for conflict with mortals, but against other fey they are willing to engage in pugilism and violence at a moment's notice. Allegedly gnomes were once least faeries who served cruel lords of the deep Earth; and only in a rebellion did they earn their freedom. No other fey helped in their bloody coup, the Kobolds and Tommyknockers turned their backs on the gnomes and the goblins mocked the attempt. 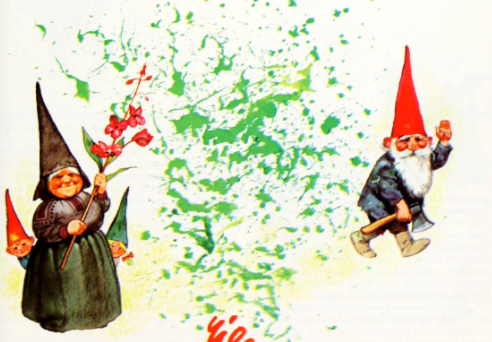 The gnomes spit upon them for their cowardice, as if they had been bold they too might be free to enjoy the world. The only true fey exception to this willingness to engage in violence would be other gnomes, as the mark of being a kinslayer in Gnomish culture is a brand that can never be lifted and taints ones entire body of work. A kinslayer is a red cap and they will walk slowly down a path of corruption where they use deadly poisons and cruel irons to make the world their slave. The mark of a kinslayer is only slightly worse than the mark of a coward, one who will not aid in the liberation of other gnomes; as such dregs of society are twisted into kikimora, the chicken-fey who make everything around them a nuisance. Why would a Gnome adventure? Why not. They enjoy travel and walking holidays as much as anyone, and while they are not particularly greedy they acknowledge that wealth grants them access to the finer things in life. It also grants them a chance to fix and rebuild anything that's been made for them, as nobody can construct items for a gnome that is just perfect save for the gnomes themselves. Some may travel to enjoy new food, or to avenge a slight against their kind by other fey. Others adventure because they lack purpose or fear how close they've come to kinslaying and seek atonement by putting their small knives to the test of felling beasts that threaten all; as such deeds are heroic and a kinslayer can never be heroic. To liberate other gnomes and prove themselves to never be even tangentially a coward, or to distance themselves from a kikimora relative by proving their own bravado is equally valid. Of course if one is adventuring in the wildwood, then a gnome makes a perfectly sensible travel companion if you can convince a gnome to adventure. They can strike up an accord with lesser beasts, go unseen for the most part, and are well-enough versed in the ways of the Fey to be of use to any mortal able to make their acquaintance and alliance. Gnomes engaged in feats of strength! Unbound Fey: Gnomes are used to going unseen, and unless addressed by enemies they may choose to Hide-in-Plain Sight at a rate of 3-in-6. 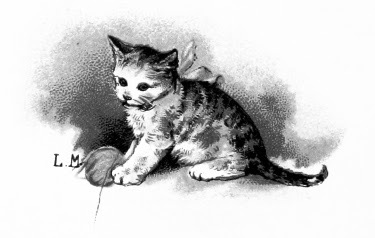 Fey Spells: Gnomes are immune to the Sleep spell unless they’ve imbibed alcohol recently, All Gnomes may once per day transform into a chicken, turkey, or pheasant for as long as they see fit and during this time they can communicate and understand simple conversation from all natural beasts and forest creatures (namely one word answers). Fey creatures of civilized intelligence such as elfs can easily see the poultry is in fact a gnome. Goblins or Trolls would see a terrible mash-up of a gnome and a bird. Silver Sickness & Weakness to Cold Iron: Like all fey, gnomes find silver items to be distasteful to touch (unless diluted with gold into electrum) and willfully gripping such item causes a Gnome to bloat up with warty boils for the remainder of the day (present even when disguised as a bird). Gnomes also suffer double-damage when struck by iron weapons. Spells: Gnomes may attempt to memorize spells as per the usual rules for creating/memorizing spells, and they may cast a number of spells per day equal to their Wisdom modifier. Gnomes may begin play with one of two spells, should they qualify for spellcasting: Sleep (which may only be cast upon items which can be eaten or imbibed, which in turn cause someone to sleep as per the spell) or Faerie Fire. Strength of Arms: Despite their small height they may grapple something as large as a man as though they were of equal size. They do not suffer a penalty when in feats of strength against an opponent due to their size. Small of Build: Gnomes may only use one-handed weapons as they are too small to wield larger items deftly. However, they also gain a +2 to their AC when being attacked by larger creatures. Gnomish Artifice: All armor must be custom-fitted for their small frames and then refitted by the Gnome himself to gain any benefit from it. Gnome Hat: The abilities of being an Unbound Fey and ones Fey Nature are lost if ever a Gnome removes their own hat, something that is generally only done if they are forced to be enemies. Gnomes only take their own hats off when safely in their homes. *Constitution modifiers no longer apply. Gnomes are particular about their hats, and they never remove them save for in their own homes as they grant them strange fey powers. Anyone attempting to remove the hat of a Gnome finds it like trying to pull a bolted down steel door off a steel wall. Despite this strength they are soft to the touch and incredibly comfortable, and Gnomes can remove them from their own heads as though they were but a merely mortal hat. The colors of a Gnome’s hat are universally red, though never the color of blood unless that Gnome has been deemed a kinslayer by his peers. To imply a Gnome wears a blood red hat, even by those who might not know any better, is a grave offense that can lead to immediate physical reprisal. Notice the different hat colors. That's Important! 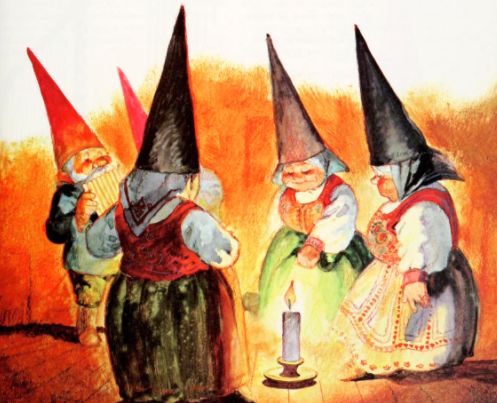 Female Gnomes wear hats of more camouflaging colors, as do retired male Gnomes who no longer patrol the wilds. Young adventuring female Gnomes have been known to take up a red cap at times, but this leads to greater chance of being perceived a kin-slayer due to the rareness of a female wearing the red that it is not often done. Long decorated ear flaps for warmth, can be buttoned around the chin. Ribbon of hat made from the hat cloth of an ancestor’s own cap. Gold-thread stitch pattern of a bull running across the bulk of the hat. White-thread stitch pattern of leaves, vines, and flowers on the bulk of the hat. Ribbon of the hat is a band of blue-beaded hamsas, with shell accents. Decorative bull’s tail tassels on the tip of the hat. Blue wax button on the side of the hat, stamped with a cockerel’s visage. Old worn fabric that bunches up like the caruncles of an old poultry bird. Pinned in iron with the tongue of a wayward kikimore. Embossed with polished redwood beads of grinning troll faces. A babushka cloth of floral pattern sewn in beneath, to keep the hair dry. Gold-thread stitch pattern of autumn leaves and cricket bugs. White-thread stitch pattern of clovers and fey knotwork designs. Beads of painted acorn and beetle-knuckles around the brim. Feather of a plover tucked in the brim, banded in man's yarn. Decorative trim of doe's tail fur. Yellow wax button stamped with image of a laughing king's visage. Quilt-work fabric that droops like the caruncles of a pheasant. Pinned in iron the severed bird's foot of a kikimora. Embossed with painted and polished birchwood beads of the sun and moon. All hats, when worn, allow a Gnome to once per day make themselves appear as a poultry bird to any non-fey who view them. Simple animals like dogs or livestock can tell the being is a Gnome in disguise as well, if only to lead astray farmers or hunters.